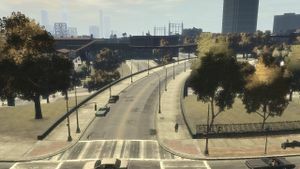 Difference between revisions of "Savannah Ave"
[[File:110111153056.jpg|thumb|Savannah Ave]]'''Savannah Ave''' is a street that connects Dukes Boulevard to Ellery St in [[Grand Theft Auto IV]]. This road is right by [[Monoglobe]] and has an entrance to [[Meadows Park]]. The [[McReary|McReary family]] live in their mother's house on this street. '''Savannah Ave''' is a street that connects Dukes Boulevard to Ellery St in [[Grand Theft Auto IV]]. It is located in the borough of [[Dukes]]. This road is right by [[Monoglobe]] and has an entrance to [[Meadows Park]]. The [[McReary|McReary family]] live in their mother's house on this street.